C-COM auto deploy satellite antenna systems. Ottawa, May 2016: C-COM Satellite Systems Inc., the leading global provider of mobile auto-deploying satellite antenna systems, has announced that it has successfully tested its first Ka-band phased array modules based on the company’s patent-pending phase shifter technology. A working prototype of a 4×4 Ka-band intelligent antenna module, (the size of a business card), employs a low-cost multi-layer planar circuit, based on an innovative architecture that is highly flexible, thin, modular, conforming and adaptive. The initial results of this innovative architecture are very promising. The tests showed that even with a few of the antenna elements turned-off, the module can still deliver an acceptable radiation pattern, without significant performance degradation. This is essential in situations when one or a few of the many elements of the active devices may have failed. Another 1×4 prototype passive phased array module (designed without any active components) was also tested and validated for Ka-band electronic beam steering capability using the C-COM patented engineered material phase shifter technology. 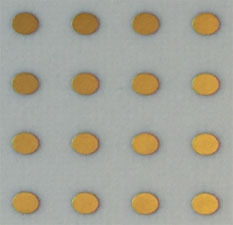 “Low insertion loss of the patent pending phase shifter over the entire range of the phase shift and operational frequency band opens up, for the first time, an exciting new possibility for developing high-performance, passive phased array systems, without the need of active devices between the phase-shifters and antenna elements. This transformative concept will significantly reduce the cost and complexity of phased array systems and hugely expand the phased array market for flat panel mobile antennas,” continued Prof. Ali Safavi-Naeini. “We are very excited about this new Ka-band antenna technology development and its potential application to expand the addressable markets for electronically steerable flat panel satellite antennas,” said Bilal Awada, CTO of C-COM Satellite Systems Inc. “The 4×4 phased array modular approach provides the basic building blocks required to manufacture new Ka-band antenna designs of various shapes and sizes for fixed and mobile applications,” continued Awada. The research work was funded by C-COM, Ontario Centre of Excellence, Industrial Research Assistance Program (IRAP) and Natural Sciences and Engineering Research Council of Canada (NSERC). “We look forward to continuing our collaboration with the University of Waterloo, OCE, IRAP and NSERC on this innovative phased array antenna technology the result of which will be a high volume, flat panel electronically steerable antenna product,” said Dr. Klein, CEO of C-COM Satellite Systems Inc.“As a research-intensive institution, we encourage industry collaboration as a means to advance technology through a mutually-beneficial partnership,” said Dave Dietz, Director of Research for the Faculty of Engineering. “With over 600 successful spin-off companies generated from the Waterloo University over the past few years, we see a great potential for more spin-off from this new technology given the wide diversity for its use”.